Orange Modern: This bold and brightly-colored kitchen features curved orange cabinets, modern bar stools, solid blue countertops, and a matching blue backsplash. Checkerboard floor tile and accent lighting give the room a bright and cheery atmosphere with a slightly "retro" feel. 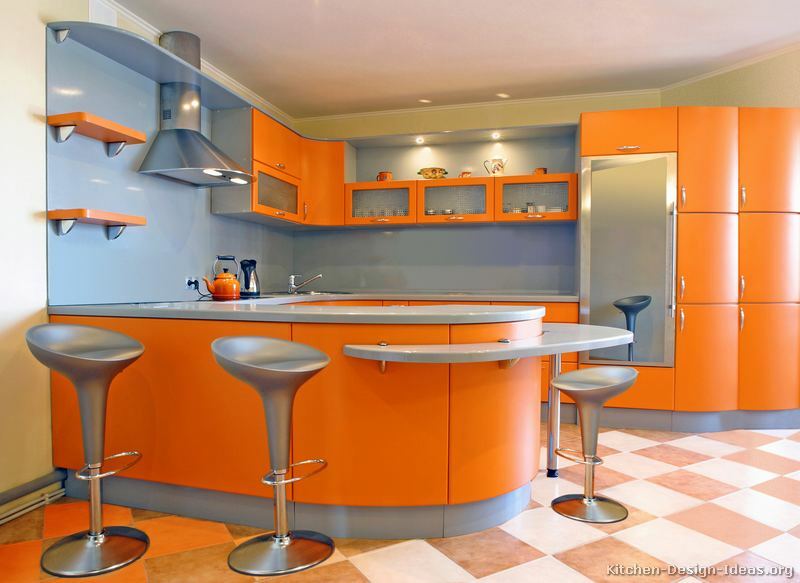 More Pictures: This kitchen is #7 in the Modern Orange Kitchens gallery. You should also see the information and pictures in our Modern Kitchens collection. Updates: To get Kitchen of the Day updates, visit Kitchen Ideas on Facebook and click "Like" to connect with us. Even More Updates: You should also follow Kitchen Ideas on Twitter to get all the latest happenings on our site.